Making sewing patterns from your initial pattern draft requires "truing" and adding finishing touches to the draft. 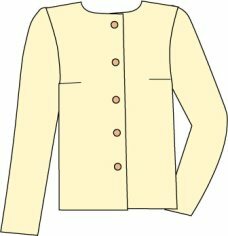 To turn your blouse block into a wearable garment, for example, the pattern must be finished and “trued”. 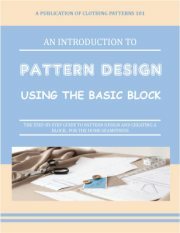 Seam allowances, a hem, facings, markings - that's what makes your pattern draft a real, usable sewing pattern! “Truing” your pattern means to make it “true”, or complete and correct. Seams and corners must match to ensure easy assembly and correct balance. First, you’ll need to check that all of your corners are square. 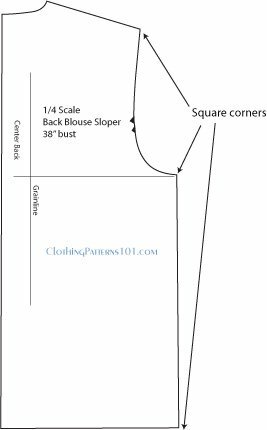 Corners that are not at a 90 degree angle will result in an uneven hem or intersection when sewing. 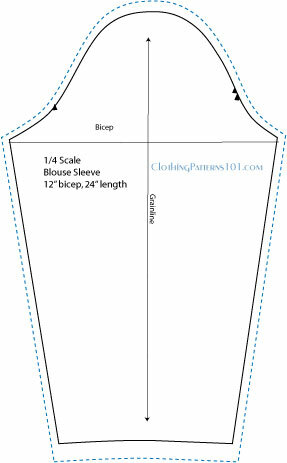 Use your grid ruler to check the corners at the shoulder/armhole, armhole/side seam, side seam/hem, etc. Then check your side seams to make certain that they are the same length, and, if cut at an angle or with a curve, that the front and back are the same shape. When everything is “true”, you’ll add your seam allowances. The easiest way is to simply use 1/2“ seam allowances on all edges. Then, you can trim as needed along neck seams, etc. Do not add seam allowance to the front - we'll address that a bit later. The seam allowances for the back are the same as for the front. Add 1/2" seam allowances to the blouse sleeve, too. 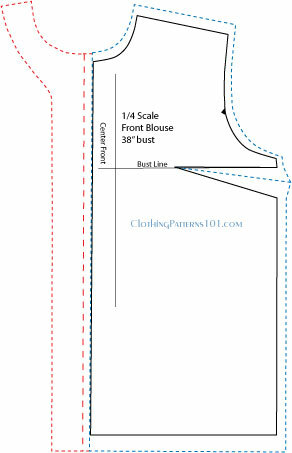 Then add a hem (I usually use 1") on the bottom of the front, back and sleeve patterns. I've also added markings at the center back that indicate this pattern piece will be cut on the fold (see marking in red), so there is no seam allowance at the center back. If you wanted to cut the back in two pieces and use a seam, then you'd add seam allowance at the center back. the width of the buttons. This is a little more complicated to explain, but it's not hard to do! The buttons are set along the center front line, and you’ll need an extension to overlap the buttonholes and buttons. The button extension is generally equal to the width of the button. For example, if you’re using a 1/2” button, draw a line (large dashed line) 1/2” from the center line. That's your extension. example is for a fold-back facing. Fold the paper along the heavy dashed line (the button extension, NOT the center front line) (tape extra paper to the front edge of the pattern if needed), then trace the neckline, shoulder, and bottom edge of the pattern. Cut along these lines. and bottom edge. Draw your facing 2 1/2” from the cut edge of the fold-back paper. Your facing will be 2 1/2” wide. Notches for matching sleeve points, or any other points that will need matching during assembly. And voila! You've made your own sewing pattern! original pattern after seam allowances are added; 2 1/2” is generally a good width for most facings. Keep designing and making patterns! 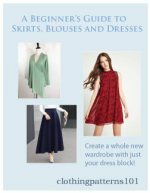 You'll come up with many, many combinations of body style, neckline, and sleeves - and many new blouses and tops you'll be proud to wear. Continue with skirts and dresses, too - you'll soon have a whole wardrobe you've designed yourself!